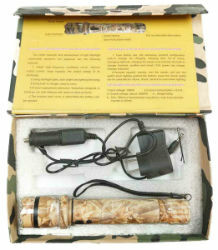 Flashlight and stun gun in one! This unit is about three times as hot as a Green Hot Shot. Though it likely wont knock someone to the ground it certainly would give them second thought on attacking you. That might be the extra seconds needed to get to safety. SUPER BRIGHT LED Flashlight in Front. All metal 1 Million Volt Stun Gun. Aircraft grade aluminum housing. Built-In Charger, Just Plug it into the Wall to Charge! Wall and Car charger included.